Low float penny stocks are a haven for profits, especially when material event changes take place that could provoke awareness to the degree that a party breaks out with vodka being the drink of choice. Such a case can be argued for CME Realty, Inc. (OTC PINK: CMRL) who, on Wednesday, will officially begin trading as South Beach Spirits, Inc. (OTC PINK:SBES), a Florida-based alcoholic beverage development, marketing, and distribution holding company whose principal brand is V Georgio Vodka. Although CMLE stock hasn’t performed well this year, even with its active volume history, the name and ticker symbol change while nearly at its historic low could put some Miami style boogie into SBES stock. South Beach Spirits is to be the publicly traded platform for former college basketball player, recording artist, and sports agent Victor G. Harvey’s V Georgio Vodka, a highly successful boutique brand that has plans for worldwide expansion, taking on the already successful luxury vodkas like Grey Goose. The spawn of SBES comes after CME Realty agreed to issue 1.4 million restricted shares to Victor, $1,000,000 in instalments, and an initial base annual salary of $120,000. The existing three product lines, V.I.P., Signature and ACAI, have been highlights for nearly a decade already, featured at the Super Bowl in Tampa as the exclusive vodka sold at the official tailgate party, the official brand at the BCS National Championship game at Dolphin Stadium and even the only vodka sold, at $15 a glass, for a championship fight at the BankAtlantic Center in 2009. The quick exposure came thanks to once part-owner, Scott Rothstein, who opened the doors for the V Georgio, the only African American owned distilled spirits company in the world. There’s an abundance of research out there to see what’s behind the V Georgio brand and how “high class” the exposure was from inception. It will be a few months until the initial financial information gets filed for investors to see within, but from the last CME Realty filings, it’s as clean as a whistle in respects to toxic debt on the books. Of the 75,000,000 authorized for issuance, 70,000,000 shares of the soon-to-be SBES stock were issued and outstanding at the time of the agreement of which Kenneth McLeod owned 50,000,000. With the deal in place, 25,000,000, half of what McLeod owned, was to be returned to the Company for cancellation which, factoring in the shares issued to Victor, makes the issued around 46,400,000 and the float still 20,000,000. 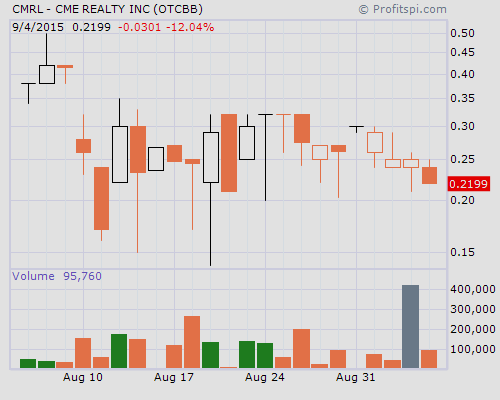 Thus far, the to-be-changed CMLE stock has been a poor performer since trading began on April 8 this year. Volume has been consistent over the last 6 weeks, but the $250,000 or so traded back in May when in the Company tried to acquire Rock N Roll Imports, Inc., a California-based developer of alcoholic beverages, is down roughly -70% from the 0.82 high it set then. The float, originally 4,000,000 before the 5-for-1 forward split in March, still has some more selling to do until the new SBES shares can build up some momentum. Alcohol related penny stocks have been coming and going for years, but SBES appears to be unique in terms of the history and celebrity interest, having been a key beverage at one of Shaq’s birthday parties years back. If the integrity of Victor G. can be passed on to SBES, this is a rising star on the OTC worth paying close attention to.